The Best Grado Headphones | DIMINISHING RETURNS? If you’re looking for a quick fix, or my overall recommendation in this Grado e series line, I would have to go with the SR80e. Some people seem to think that all of these headphones sound more or less identical. I wouldn’t necessarily agree with that completely, but there is some truth to it. The differences in each of these is marginal, but you will notice it to some degree. The problem is that of diminishing returns. The more you spend, the smaller the improvement. The other issue is that if you were to buy a more expensive model, there’s no going back to the entry level stuff. It’s kind of a double edged sword, which is why I would go with the SR80e. It sits in a nice comfortable price range, and will get you most of the way there. What I mean by this is that sure, you may be missing some detail with the more expensive models, but it’s not enough to warrant spending all that money. The 80e is a phenomenal headphone, and will get you around 90-95% of the signature Grado sound. You can always upgrade later! Interested? Interested in learning more about the e line? Read on for an in depth review/comparison!! Before we get into the best Grado headphones though, grab a snack, sit back and relax because.. Note: This article will change and update based on the current series that’s in production. Right now, it’s the e series. Whenever necessary, I will revisit and continue to keep things relevant. Check back every so often for changes! The Grado line is quite unique in that all of their cans are hand crafted in Brooklyn New York. The Grado family has flown mostly under the radar, but their headphones have become increasingly popular due to the incredible sound. Their very first headphone was built in 1991 by John Grado, and the first metal one came not soon after in 1993, in the form of the Grado SR325. There would be many more milestones for the family, and their roots can be traced all the way back to 1950. What’s interesting to me is that they started out making phono cartridges, speakers, tonearms, and turntables! Even more impressive is that they still to this day have not paid for advertisements or endorsements. Production of turntables would begin to slow down in 1988, and eventually Joseph Grado would go on to retire in 1990. His nephew John would buy the company from him, and not soon after, headphone production would begin in 1991. The 60e begins with quite a stunning sound signature. There’s detail, clarity, and a nice sense of space with these. The mid-range and treble are both phenomenal, and the bass has nice extension but doesn’t really slam. They do well with nearly all genres, but their bread and butter is most definitely for rock, metal, and anything with electric guitars. Lol. The build quality isn’t as bad as some people claim, although it still is a bit questionable. I haven’t personally had any issues with the cans I’ve tried, but it’s something to keep in mind. Comfort is pretty good overall, especially for an On-ear headphone. There have been complaints with the ear-cup pieces however. One solution to the comfort issue is to purchase separate ear-pads. The Ear zonk L-Cushion donut pads were a big hit among-st reviewers, and did improve comfort levels significantly. The SR80e picks up where the 60e left off. While the sound is mostly identical, there are a few subtle differences to speak of. All of the specifications are exactly the same, except for weight and the cable length. The SR80e is 130.4 grams, while the 60e is 124.7 grams. The same general things apply to the 80e as with the 60e. Operating Principle: Open air. Closed back vs. Open back headphones. I got a chance to try out the SR125e, and the sound really isn’t improved much at all in my opinion from the 80e or 60e. You’re better off just skipping this one and heading towards the SR225e. These also sound phenomenal out of your phone, but I found that the 3.5mm jack is extremely bulky, and will not fit into my Otter Box. I’m still using a Samsung Galaxy S5. The cable itself is very sturdy, if a tad bulky. Still, I found it less cumbersome than some of Grado’s other offerings. The relationship between weight of headphones vs. weight of cable is a little more balanced here. Will not fit into a phone with a large case. I had to take my phone out of the Otter Box which was a little irritating. Still, I can excuse this because of the eargasmic sound. The SR225e’s come with L cushions, while the SR125e’s come with S cushions. Frequency Response: 18Hz – 24kHz. The SR325e provides a bit of a punchier bass with the same overall sound as it’s predecessors. The 325 also has a leather headband, and metal encasing, as opposed to the Polymer and plastic of the SR80e. The 325’s weigh more as well, and the overall sound is brighter and thus more revealing. There is a detail here that you won’t find in the 125e or 225e, but keep in mind the difference is rather subtle. I would say as the price and model number increase, the sound becomes more lush, intimate, and enveloping. You really start to get a better sense of soundstage, and things become more realistic. The better the model you listen to, the less likely it is that you’ll be able to go back to a previous iteration. The sound with each successive unit gets better and better, but it’s not necessarily a gigantic leap. It’s more of a smaller incremental improvement. The headphones will reveal poorly mastered sources better than most headphones, so be more picky about your files and the music you listen to in general. Sensitivity: 98 dB SPL/V. What is Sensitivity in Headphones? Right off the bat, the reference series showcases an authentic mahogany wood finish, as opposed to metal or plastic in previous iterations of the line. Make no mistake, each of these headphones are hand crafted from real wood in Grado’s Brooklyn headquarters. The RS1e’s have a bit smoother of a treble than any of the Prestige series models, and won’t become sibilant quite as easily, if ever. They’re also engaging at any listening level, and sound just as interesting at a low level as they do a higher one. Your source is important, as these won’t flatter the music but will instead present it to you as is. It’s highly advised to listen to high quality files such as FLAC, WAV, or at least 320 kbps MP3’s. All in all, these articulate piano notes and music in general with startling ease and clarity. Users note that the bass isn’t quite up to par, but I found it to be more than enough. It’s more of an articulate, detailed bass rather than one with a lot of impact. The cable is still very thick. Note: I could not find a good review for these online. I will hopefully be posting one of my own very soon. Stay tuned. Frequency Response: 14Hz – 28,000kHz. The sound differences between the RS2 and 225 aren’t monumental, but they’re there. To put it simply, after hearing the RS2e, you won’t go back to the 225 because the sound is just better. The bass on these is heavier, and the soundstage is also wider and more spacious. What is Soundstage? The bass has more slam while still remaining incredibly clear, articulate, and detailed. The sound as a whole is also just a little bit clearer, which is something I’ve noticed in each successive model. Like the RS1e, these won’t bite as much in the treble when turned up, as opposed to the cheaper models in the Prestige line which can sound a bit grating at times. To put it bluntly, yes the RS2e’s are better than anything in the Prestige line. Does that warrant the big gap in price increase? Not really. Will you go back to the 225’s after listening to these? Nope. More on that in the Final Word. The wood may cause a squeaking noise, but should go away over time. If you listen to a lot of bass heavy music these may not quite get the job done. Will reveal defects in your source file if it’s not up to par. Same as the RS1e. The bass on the 1000e is very realistic, and not lacking in the least. Of course, there will always be people with unrealistic needs, but I found that the bass is highly sufficient in pretty much all Grado models, and the 1000e is no exception. Continuing in the vein of the RS2e, the GS1000e improves on soundstage, clarity, and a more spacious/airy presentation. Vocals also take on a more realistic quality, being much more vivid, with a greater clarity. You’re able to discern and understand artists better, and you can play the headphones pretty loudly without sibilance (much like the RS2e). A big difference in the 1000e is a sense of being able to pin point instruments with a lot better precision. It becomes easier to locate instruments, but it’s also very dependent on your source file. The higher the quality the better. Again however, the question of if it’s worth 3x the price of the SR325 is debatable, if not outright not worth it. That said, like the RS2e, if you hear the the 1000e or happen to purchase it, there’s no going back to lesser models. The bass warms up as you burn them in. Something to keep in mind is just that; they may need some time to open up. They may sound overly bright at first, but will settle down the more you use them. Positioning them down and forward on your head will enable you to listen to them for hours without discomfort, as the drivers won’t touch your ears. The headphones are quite large and bulky, but aren’t very heavy. Like the other models, these terminate in a 1/4″ plug and come with a 3.5mm adapter for your phone. Be aware that they also will not fit into a phone with an Otterbox, and you’ll have to take it off to listen with them. The cable is even thicker and longer than some of the other Grado offerings. Not exactly a good thing, but I can forgive these shortcomings because of the impeccable sound. Grado does not provide a case, and with a headphone of this caliber and price, you would expect one. Frequency Response: 14Hz – 29,000kHz. The PS500e takes the sound of previous headphones and mellows out the highs a bit, contributing to a much warmer overall sound, but a smaller soundstage. While the bass is toned back more, the mid-range is notably better on the 500e in comparison to something like the RS2e. Rock will thus sound better with the 500e, as the treble is more mellowed out and less sibilant and harsh. Why the 500e’s aren’t quite worth the price is that you can achieve the same sound with something cheaper, coupled with an amp. The treble is noticeably tamer on this model, with less bass and a smaller soundstage. The mid-range however is improved. They do better with good source files. Note: I think Z is a bit harsh on the 500e’s. He makes a couple of strong points: Namely, that build quality has not improved as the price of each successive model goes up. Also, is the 500e worth the price tag? Probably not. However, I would disagree about his overall opinion of the sound signature. I think the Grado line provides an incredibly detailed (if sometimes harsh), and intricate sound. Frequency Response: 5Hz – 50,000kHz. The PS1000e’s round out the lineup with more of the same great qualities that the others possess, including a detailed, snappy bass that isn’t overblown or muddy, and the treble sparkles like usual. The pin point precision and accuracy is there, with reports of even being able to discern which way the microphone is pointing towards an instrument! A pretty bold claim for certain, but just know that the space between instruments delivers more clarity than previous members, but it’s probably not enough of a difference to warrant such an outrageous price. Notable differences include an increased driver size of 50mm, and a broader frequency response. Keep in mind you can’t really hear anything over 20kHz, so it’s a bit of a marketing ploy. The PS1000e’s are heavy, much heavier than the other models in the line. These might actually need some separate amplification, which is a surprise considering Grado headphones in general don’t. As usual, the better the source file, the more enjoyable your experience will be. All are open air, and leak sound. You’re going to want to listen in a somewhat isolated studio space/comfort of your own home. None of these are really meant for on the go or portable situations. All are Supra-aural, and fit on your ear. While I really thought the comfort factor of some of the earlier models was pretty spot on, the more expensive models are definitely hit and miss, and may require a ear-pad swap. All have roughly the same type of signature. While there will be small improvements as you ascend in class, a lot of the time it’s not enough to warrant the increase in price. That said, once you hear or own a Grado headphone that’s at any point more expensive than the last one, you’re likely not going back. All have roughly the same type of build quality. While the build isn’t the best around, I do think it’s good enough for the cheaper models. However, once the price starts to escalate, the build quality should be markedly improved and it simply isn’t. That said, I believe that 2 headphones in particular will get you around 90-95% of the sound. They are the SR80e and the SR225e. Sure, you could spend more and get more clarity, but the law of diminishing returns starts to kick in after the 225. That is, the increase in quality gets smaller and smaller relative to the price. This is an issue with most headphones above $600, and the Grado line is no exception. I’m in no way trying to bash any of these, but I have to be honest. I love the sound of all of them, but I wouldn’t pay for most of them given the astronomical price (for some) and kind of lackluster build. It is good for the most part, but could be so much better. With all of that, the SR80e and SR225e are my top picks, as I saw a pretty significant increase in sound quality from one to the other. SEE THE GRADO SR80e FOR YOURSELF ON AMAZON!! 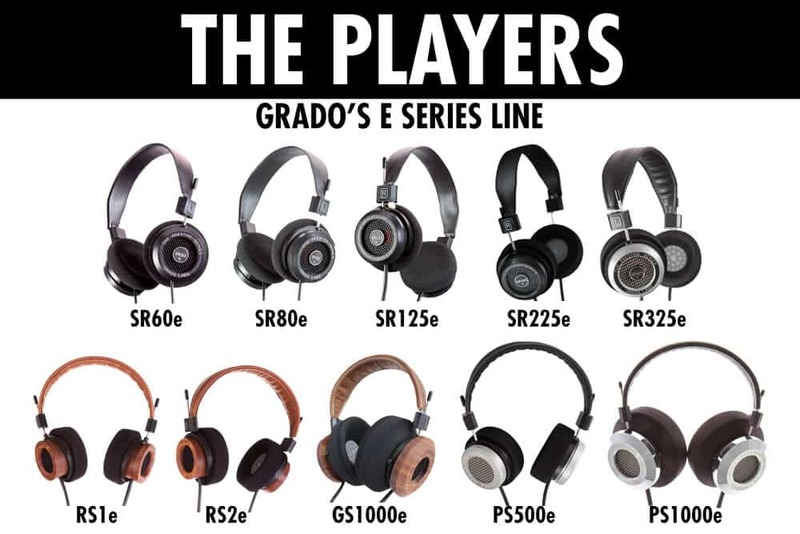 SEE THE GRADO SR225e FOR YOURSELF ON AMAZON!! Well that’s about it for today my friend! I hope you’ve enjoyed this article on the best Grado headphones. Questions? Comments? Requests? Did I miss the mark on something? Looking for something else? Please Contact me!! What do you think about the SR80e and 225e? Is there another headphone on this list that you would purchase? I would love to hear from you. Until next time..